Showing posts by Rachel Posner. As record-breaking snowstorms blanketed Washington, D.C. this winter, I took advantage of the citywide freeze to read Cleo Paskal’s new book, Global Warring: How Environmental, Economic, and Political Crises Will Redraw the World Map. In it, Paskal makes a compelling case for why the West should care about the geopolitical shifts—already underway—that will be exacerbated by climate change. Paskal eloquently explains the science behind climate change in layman’s terms, breaking down incredibly complex issues and drawing connections across seemingly disparate challenges, such as rising food prices, degrading energy infrastructure, and growing water scarcity. She is a skilled storyteller, using memorable vignettes (and at times even humor) to effectively illustrate these climate-related complexities. But what truly sets Paskal’s book apart from a number of recent works on this topic is her ability to elucidate the major power shifts that are directly related to today’s climate and resource stresses. “Environmental change is the wild card in the current high-stakes game of geopolitics,” she writes (p. 249). Such natural resource stresses will only become more pronounced in the future. Global Warring highlights a number of key challenges and opportunities that could take the United States and other Western nations by surprise if they don’t change policies now to secure their positions as major global powers. Impacts of Environmental Change: Like the developing world, the United States and other Western nations will suffer from extreme weather events and the broader effects of environmental change. However, the United States has “institutional, regulatory, political, and social” weaknesses that affect its “ability to absorb the stress of repeated, costly, and traumatic crises,” including its expensive, aging infrastructure, writes Paskal (p. 40). For example, while the country will face more Hurricane Katrinas, the U.S. military is still not adequately prepared to address such domestic environmental disasters. Transportation Routes and Trade: The Northwest Passage—the sea route that connects the Atlantic and Pacific Oceans through North American waterways—is a highly coveted trade route that will become all the more valuable as Arctic ice continues to melt in the years ahead. Already the United States, Canada, Russia, China, and even the European Union are engaged in a geopolitical chess game for control of the Arctic. Each is staking a claim to the natural resources below the surface, new shipping routes, and strategic chokepoints. According to Paskal, if the West wants to remain “a major force in the twenty-first century,” the United States and the EU should help Canada secure its claim to the Northwest Passage. This way, Canada could protect its borders and “talk to other countries, including Russia, on a more equal basis about creating and jointly using facilities like search, rescue, and toll stations, and on methods of speeding legitimate, safe shipping and exploration in the northern waters,” she writes (p. 125). New Power Dynamics and Partnerships for China, India, and the West: China and India are two of the world’s fastest growing economies and each are taking on new roles in Asia and beyond. But could climate change and environmental challenges stem their growth, or will these “powerhouse” countries prove resilient? As the global power balance begins to shift toward Asia, Paskal sees India as the “swing vote” that might shape the future of geopolitics for the next long while” by aligning itself with Russia and China and potentially marginalizing the West (p. 185). Alternatively, the West could finally acknowledge India as an equal partner—for example, by strengthening civilian nuclear cooperation—and thus help foster stability over the long term. Stresses on natural resources, now and in the future, will only increase the importance of strong alliances and geopolitical partnerships. Rising Sea Levels in the Pacific Ocean: Most Americans and other Westerners are not terribly concerned about the welfare of the small-island nations in the Pacific whose entire existence is threatened by sea-level rise. Paskal rightfully draws our attention to the ambiguous state of the international law of the sea, which leaves much of this region up for grabs when sea levels rise and coastlines change. “At stake is access to fisheries, sea-lanes in relatively calm waters, control over regional security, unknown underwater resources, geostrategic advantage, and geopolitical political leverage,” she writes (p. 214). China has already gone to great lengths to secure its control over the Pacific, and if it continues to be successful, the United States will risk losing influence in the region. Throughout all of these cases, Paskal weaves in a discussion of the growing and strategically significant practice of “nationalistic capitalism.” For example, she describes how China’s state-owned companies work with their government to “advance national strategic interests,” often signing bilateral deals that “cut out the open market and overtly link much-needed resources to wide-ranging agreements on other goods and services, including military equipment” (p. 94-5). As China and other nationalistic capitalist countries expand their reach into the resource-rich regions of Africa and Latin America, fewer resources (like food and fuel) will be available in the open market. For the United States and other “free market” nations, this practice could lead to higher prices and increased competition for business and political alliances. Overall, Global Warring is an excellent read that I would recommend to friends and colleagues, especially those tracking long-range global trends and promoting farsighted policies. I appreciated Paskal’s recurring call for abandoning short-term expediency in U.S. decision-making in favor of a longer-term approach. Paskal shows how over time the United States’ short-term interests are creating major vulnerabilities that will be worsened by environmental stresses in the future. The book’s only notable shortcoming is its skewed geographic scope. Paskal focuses heavily on North America and Asia, particularly China and India, and only briefly mentions Africa, Latin America, the Middle East, and Australia. Obviously, a book about the shift of major world powers would concentrate on the most influential players, but these other regions are worthy of greater consideration given their critical natural resources, demographic trends, and ongoing climate adaptation efforts. Regardless of how the climate changes, the environmental trends described in Global Warring are already manifesting as geopolitical realities that will dramatically affect the United States. As Paskal says, “Countries that want internal stability, influence over allies, control over sea-lanes, and access to critically important resources better start planning now (p. 235). Rachel Posner is a fellow in the Energy and National Security Program at the Center for Strategic and International Studies (CSIS). Previously, she has served as the assistant director of the CSIS Global Water Futures Project; research associate with the CSIS Global Strategy Institute; and Brent Scowcroft Award Fellow with the Aspen Strategy Group. When I tell people I have been working on a report about U.S. international water policy, they usually respond with the same sardonic question: “The United States has an international water policy?” The answer, of course, is complicated. Yes, we have localized approaches to water challenges in parts of the developing world, and we have more than 15 government agencies with capacities to address water and sanitation issues abroad. And yes, the State Department and the U.S. Agency for International Development published a joint strategic framework this year for action on water issues in the developing world. However, the U.S. government (USG) does not yet have an overarching strategy to guide our water programs abroad and maximize synergies among (and within) agencies. Furthermore, the 2005 Senator Paul Simon Water for the Poor Act—which calls for increased water and sanitation assistance to developing countries—has yet to be funded and implemented in a fashion that satisfies lawmakers. In fact, just last week, legislation was introduced in both the House and the Senate to enhance the capacity of the USG to fully implement the Water for the Poor Act. Why has implementation been so slow? An underlying problem is that water still has no institutional home in the USG, unlike other resources like agriculture and energy, which have entire departments devoted to them. In the current system, interagency water coordination falls on a small, under-resourced (yet incredibly talented and dedicated) team in the State Department comprised of individuals who must juggle competing priorities under the broad portfolio of Oceans, Environment, and Science. In part, it is water’s institutional homelessness that hinders interagency collaboration, as mandates and funding for addressing water issues are not always clearly delineated. So, what should be done? For the last year and a half, the Center for Strategic and International Studies’ (CSIS) Global Strategy Institute has consulted with policy experts, advocates, scientists, and practitioners to answer this million-dollar question. 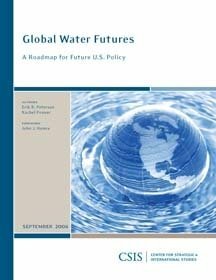 In our report, Global Water Futures: A Roadmap for Future U.S. Policy, we conclude that if we are serious about achieving a range of our strategic national interests, water must be elevated as a priority in U.S. foreign policy. Water is paramount to human health, agricultural and energy production, education, economic development, post-conflict stabilization, and more—therefore, our government’s organizational structure and the resources it commits to water should reflect the strategic importance of this resource. We propose the creation of a new bureau or “one-stop shop” for water policy in the State Department to lead in strategic planning, implementation, and evaluation of international water programs; mobilize resources in support of water programming overseas; provide outreach to Congress and important stakeholders; and serve as a research and information clearinghouse. This would require significant support from the highest levels of government, increased funding, and greater collaboration with the private and independent sectors. The current economic crisis means we are likely to face even greater competition for scarce foreign aid resources. But I would argue—paraphrasing Congressman Earl Blumenauer at our report rollout—that relatively little funding toward water and sanitation can have a significant impact around the world. As we tighten our belts during this period of financial instability, it is even more important that we invest in cross-cutting issues that yield the highest returns across defense, development, and diplomacy. Water is an excellent place to start. Rachel Posner is a research associate at the Center for Strategic and International Studies’ Global Strategy Institute. 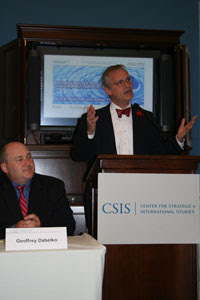 Photo: Environmental Change and Security Program Director Geoff Dabelko and Congressman Earl Blumenauer (D-OR) at the launch of Global Water Futures: A Roadmap for Future U.S. Policy. Courtesy of CSIS.